Fast-growing end markets and a smart acquisition could boost Marvell Technology. The semiconductor sector didn't have a great 2018 due to a combination of factors including an increase in inventories, slowing memory chip demand, and the U.S.-China trade war. Not surprisingly, Wall Street has lost confidence in chip stocks, as it is widely believed that the industry is looking at a downturn. That's probably why shares of Marvell Technology (NASDAQ:MRVL) have lost more than a quarter of their value in 2018 despite clear signs that the company is gradually stepping on the gas. The chipmaker is busy going after lucrative niches within the semiconductor space that could help it grow at a faster pace than the broader industry, paving the way for a strong turnaround in 2019. 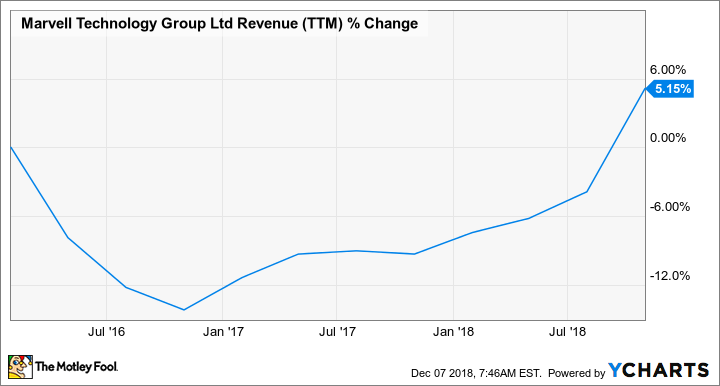 Marvell's top-line growth took off impressively in 2018 as its efforts to tweak its business model toward growth-centric revenue streams started paying off. The chipmaker realigned itself to focus on verticals like Internet of Things (IoT), storage, and networking. And it made a smart acquisition to complement its business lines. MRVL Revenue (TTM) data by YCharts. The company's $6 billion acquisition of Cavium has boosted the former's addressable market by $8 billion to a total of $16 billion. This is much more than the company's trailing-12-month revenue of $2.5 billion. More specifically, Marvell can now tap into markets such as data center switching, next-generation network computing, and storage connectivity. It was originally into selling storage, networking, and wireless connectivity solutions, so it was smart to acquire Cavium, as it complements its existing markets -- Marvell can cross-sell its products to Cavium customers and vice versa. Cavium's contribution to Marvell's revenue was better than expected last quarter at $210 million. Marvell expects Cavium's revenue to increase to $240 million in the current quarter, clearly indicating that the integration of the two companies is accelerating sales. The chipmaker expects to sustain the revenue growth momentum on the back of catalysts such as the increasing demand for Ethernet switches, a business that has been growing in the double digits for the past few quarters. Sales of Ethernet switches are predicted to get better on the back of network upgrades and data center expansion. This is great news for Marvell as the Cavium acquisition adds data center switches and Ethernet adapters to the former's product portfolio. Similarly, Cavium has expanded Marvell's reach within the storage market. Marvell's original storage product portfolio contained hard-disk drive (HDD) and solid-state drive (SSD) controllers, but it now sells storage connectivity products such as Ethernet and fiber channel as well. This opens up a strong cross-selling opportunity for Marvell since its SSD shipments had surpassed the 50 million mark around a year ago, indicating that it already has a solid customer base. Moreover, the SSD market is predicted to grow at a compound annual growth rate of 15% for the next five years, and Marvell now has a greater chance to capitalize thanks to Cavium. Marvell's margin profile has been improving following the Cavium acquisition. Cavium's non-GAAP gross margin was a shade over 65% in the fourth quarter of 2017, while Marvell's non-GAAP gross margin before the acquisition was announced in November last year stood at 61.6%. The company's non-GAAP gross margin increased to 64.6% in its fiscal third quarter, which ended on Nov. 3. Margins should get better as the company now expects to achieve annual cost synergies of $200 million after the acquisition, up from its original expectation of $150 million to $175 million. The company has already achieved $120 million in operating expense synergies, so it should witness stronger margins. That's probably why analysts expect Marvell's earnings to increase at a faster pace in fiscal 2020, which begins in February. More specifically, the chipmaker is estimated to deliver $1.46 in earnings per share in fiscal 2020 versus $1.25 this year. By comparison, Marvell's earnings stood at $1.19 a share last fiscal year. So it looks set to deliver stronger growth in the new year, and investors won't have to pay a lot to buy into it, as shares trade at just 11 times forward earnings. Will Marvell Ever Increase Its Dividend?